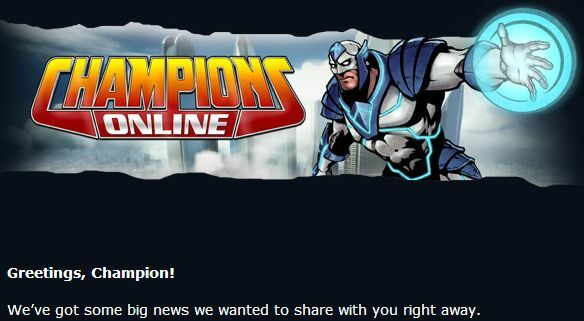 I got a little surprise in my email from Cryptic this morning that Champions Online was going F2P in Q1 of 2011. First thing I did was check the site and found the official State of the Game announcement, confirming it was real. My first thought after that was I should shut off Twitter for the day while the drama storm blows through, obviously the forums as well. Before I get into the changes, let me say that this announcement didn’t cause the same emotional panic that Turbine’s did. First, I don’t have the same history with the Champions lore that I do with Tolkien’s books (impossible to match given my childhood exposure to Middle-earth). Second, Cryptic’s using the same hybrid model that Turbine is using so my expectations are pretty much already set. There’s going to be a review and update of the power documentation and interactions. Poz highlights some streamlining of holds in order to eliminate some weird problems that have been cropping up. The big change is the addition of Archetypes. This was something that set off alarm bells for me, since archetypes is one of the things I didn’t like in CoH. Apparently though these archetypes don’t map directly to team roles or to power frameworks, but mimic certain types of comic book heroes. F2P is launching with eight of these with plans to add more later. No powers are being removed, existing characters won’t be impacted, and new characters can be just as flexible by using the Custom Archetype , although that is limited to gold players. I’m not planning to use Archetypes myself, but I can see this being a benefit to new players who don’t understand about super stats, passive defenses, talents, etc. Outside of the power/character changes, they’re revamping the 1-20 leveling experience. The content changes seem pretty smart, as far as I can tell. The tutorial could definitely use a refresh based on lessons learned from Vibora Bay and the Adventure Packs, and having the players go to Millennium City after the tutorial rather than the Desert or Canadian crises makes MC more of the hub zone is should be. Just like Turbine did, Cryptic is using a hybrid model, although theirs is a little simpler. You are either subscribed and a gold player or playing for free as a silver player. Lifetime subscribers are considered gold players. Gold players get all zones, levels, adventure packs, costume parts, and powers. Exactly the same as subscribers do now. Free players have access to all zones and levels (except adventure packs), but don’t get access to the Custom Archetype so they’re more limited in what combinations of powers they have access to. They are also limited in their inventory and bank space and market access. Check out their Feature Matrix for more details. Cryptic’s current plan is more free-to-play than Turbine’s is. You can level a hero from 1-40, you just have some limitations in inventory slots and are more restricted in your power selection. 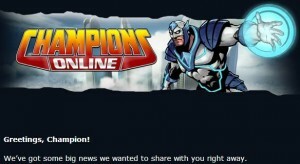 But based on what they’re currently planning, you can get to max level for free in Champions Online, which is not something that you can do in Lord of the Rings Online. All in all, just like with Turbine’s announcement, not much changes for me. I’m not upset that I bought a lifetime membership, I can still play how I want whenever I want and don’t have to spend money on a monthly subscription. As much as I enjoy the ability to mix and match powers based on a character concept, a silver plan would never have worked for me. Had Cryptic offered lifetime gold, gold, and free silver plans at launch, I would still have bought the lifetime gold. I think Champions Online silver would be perfect for me. As a game, I never thought it offered enough depth but recognized that it could be a lot of fun to play every once in a while (in many ways I feel the same way about STO, which is why I’m okay with not getting the lifetime subscription). I think I’ll buy zones, adventure packs, etc. only when I feel the need, so I’ll still get to play but save a lot more than a sub in the long run. I’m really excited, I still have a character in CO I would love to check in on again.